Gov. Steve Bullock is taking Tim Fox to court after the state attorney general issued an opinion that is holding up state conservation easements. 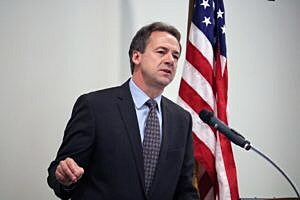 On Monday, the governor’s office announced that Bullock filed a lawsuit to ask the Montana Supreme Court to overturn Fox’s Oct. 15 opinion that the state land board was required to vote on all but the smallest conservation easements that state agencies proposed. Fox’s opinion could cause a logjam in Fish, Wildlife & Parks’ efforts to help landowners get their easements. If the Supreme Court upholds Fox’s opinion, it could stymie all future conservation easements, including three that are in the pipeline. One of the easements needs approval before Nov. 30, so time is of the essence. The governor’s chief legal counsel, Raphael Graybill, said that in situations where officials need only a legal opinion, the Supreme Court can act quickly provided the justices agree to consider the case. So the governor could have his answer before the end of November. Montana sportsmen hope that’s the case so the North Sunday Creek Easement in Custer and Rosebud counties can finally gain approval. Prior to Fox’s opinion, the land board – a five-member panel that includes the governor, Fox, Secretary of State Corey Stapleton, Auditor Matt Rosendale and Superintendent of Public Instruction Elsie Arntzen – was required to vote on land purchases but not conservation easements. The land board would simply endorse easements after the state agency, primarily Fish, Wildlife & Parks, spent one to two years investigating to make sure they were qualified and then the FWP commission would vote to approve or not. FWP considers only conservation easements that have good wildlife habitat, and landowners must allow some level of public hunting on the land. Then FWP must have enough money in a legislatively approved fund, Habitat Montana, to buy the easements. But in March, the process started to change. The FWP commission gave final approval in February to the purchase of the $6.1 million Horse Creek easement, which covers more than 15,000 acres in Wibaux and Dawson counties in eastern Montana. Hunters such as Justin Schaaf of Fort Peck were excited about being able to hunt on the easement. But they were disappointed in March after three Republican land board members postponed the vote, citing a need for more information. “To our dismay, the land board tried to kill the Horse Creek easement when it came before the board,” Schaff wrote in an oped piece. Complications resulted because the land being considered was a split estate, meaning the Stenson family owned the land but others owned the mineral rights underneath. The mineral-rights owners complained an easement would prevent them from drilling if they wanted. Subsequent mediation talks led to a solution a month later. Because proposed conservation easements take so long to work out, they usually can’t handle much delay. Often, FWP has helped landowners find purchase money from other sources, such as the federal Agricultural Land Easement program, which have deadlines. So FWP was worried the proposal would time out. Then Bullock reviewed state law, which he said gave the FWP commission the authority to approve the purchase of easements without land board approval. As a result, he had FWP finalize the easement in June. Fox had voted with Bullock on the land board to approve the easement, but he criticized Bullock’s decision to move ahead. “Not only is he ignoring long-standing practice, he has created a scenario in which the land title for the Horse Creek property is in legal limbo. I’m disappointed with the governor’s decision,” Fox said in a June statement. Montana Senate President Scott Sales, R-Bozeman, asked Fox to issue a legal opinion on the matter. Fox responded with his Oct. 15 opinion that FWP must get land board approval to purchase conservation easements of more than 100 acres or that cost more than $100,000. Horse Creek is not the only easement the land board has stalled. Some Republicans are opposed to conservation easements because they limit land development. Montana Sportsmens Alliance spokesman Joe Perry said easements can provide money to help younger people stay on their land. Plus, Republican lawmakers have increasingly limited how Habitat Montana funds could be spent to buy land, but they’ve supported paying for conservation easements. Contact reporter Laura Lundquist at lundquist@montanacurrent.com.